You don’t have to be president of a big automobile company to have a dream car, Maj. Ralph W. Angel, U. S. Air Force jet pilot, discovered. He simply bought a secondhand Chevrolet while stationed in Germany and drove it to the Spohn body works in Ravensburg. He sketched up his idea of a dream car (inspired considerably by General Motors’ famed Le Sabre) and turned the Chevrolet over to the body men. In six weeks, he had his dream car. It is completely custom built as far as sheet metal is concerned. The chassis and engine are stock Chevrolet except for a dual carburetor and a split exhaust manifold that leads, to twin exhaust pipes. It cost the major $4500. Since his return to this country, he has sold the car to a Phoenix, Ariz., used-car dealer. “It attracted too much attention,” Angel said. The back end looks more like a Lockheed Constellation than a Le Sabre, but what do I know? Do those air intakes at the back of the passenger compartment do anything, I wonder? It’s common to put them there on rear-engined cars, but this clearly isn’t one. Rear air scoops like that can also be used to cool the brakes on performance cars, but those are probably as fake as the plastic ‘vents’ commonly seen on 4th generation Mustangs. These’ve never made much sense to me. Anyone who would be impressed by such features would also immediately spot that they’re fake and judge the owner appropriately. I can’t tell about the specific scoops on this custom car, but it wasn’t unusual in the early 50’s for air conditioned cars to have air scoops in the rear to cool the air conditioning condenser – in those days the A/C was usually in the trunk instead of under the hood. It’s a stock Chevy chassis, so yes, the scoops are just as non-functional as the fins and jet exhaust. 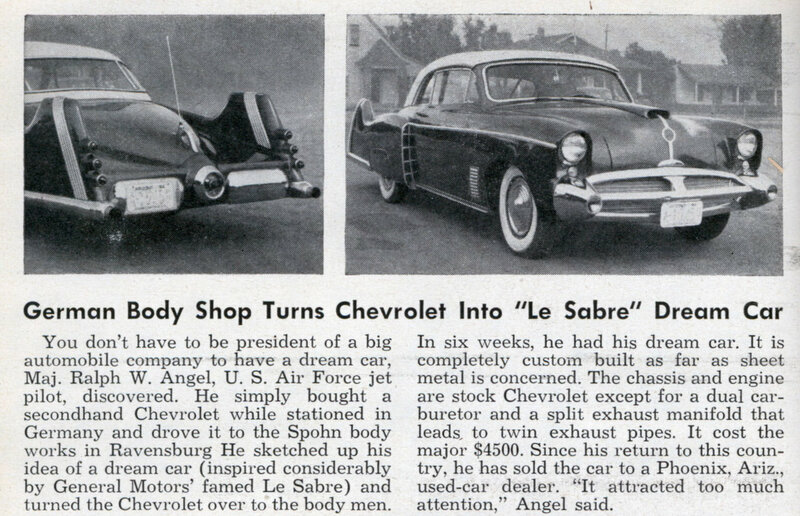 The article’s LeSabre reference is to the infamous Harley Earl / GM concept car of 1951 known as the Le Sabre, not to a plane. Any scoop on a Spohn Custom from the 1950s is functional whether it be hood intake, brake cooling intake, or engine compartment heat relief through the sides of the front fenders. I own a 1952 Spohn Custom coachbuilt on a 1940 Ford chassis. Welcome to learn much more about these Spohn Creations at my Facebook page for them; same title as my nickname here. As you may remember my Spohn Custom, The Comet (1941 Packard 110) uses the left hand side body vent to pick up fresh air and channel it through into ductwork located behind the rear seat back and then up to two separate diffusers positioned along the inside bottom edge of the back window (under what we refer to as the parcel shelf). The purpose was for demisting the glass. In addition, the outside of the rear window was swept by an electric windscreen cleaner blade when required. 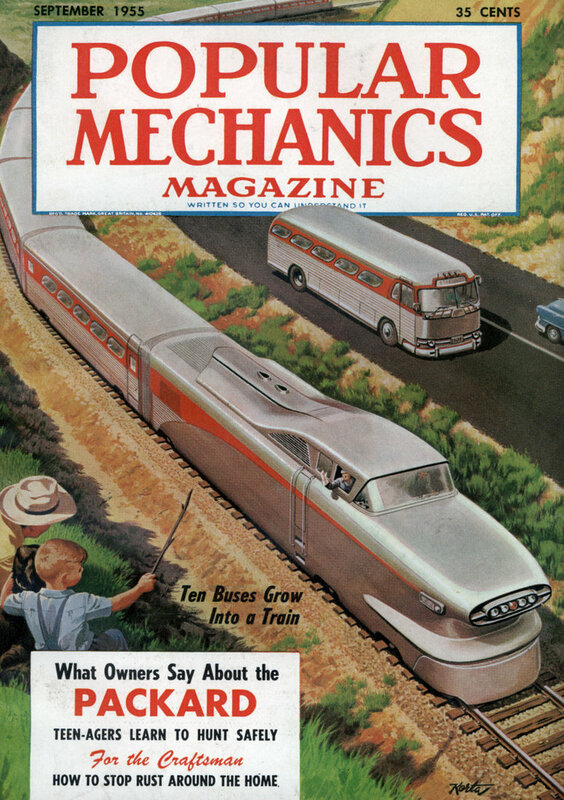 There weren’t many of these installations on automobiles in 1953.